EKWB has announced the release of two new monoblocks made for GIGABYTE and MSI Threadripper X399 motherboards. Both blocks are an all-in-one (CPU and power delivery) cooling solution with a redesigned cold plate and fin area, claimed to cover most of the Ryzen Threadripper surface enabling better thermal transfer. In addition to the CPU itself, the block also cools the power delivery with liquid flowing directly over the necessary components. 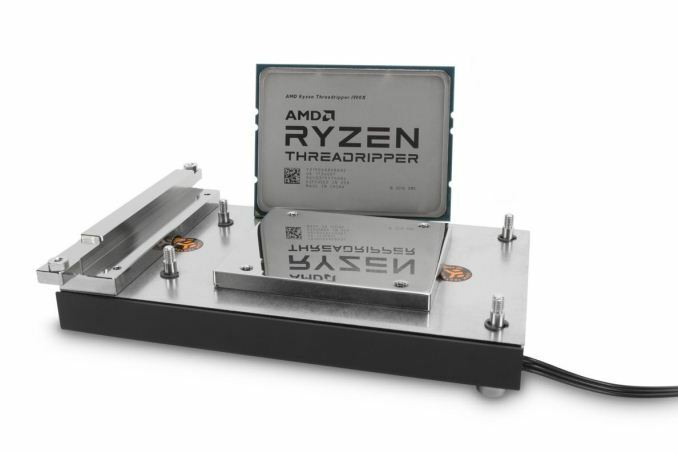 One could argue that with sufficient cooling, pushing Threadripper CPUs beyond their TDP through overclocking should be easier. 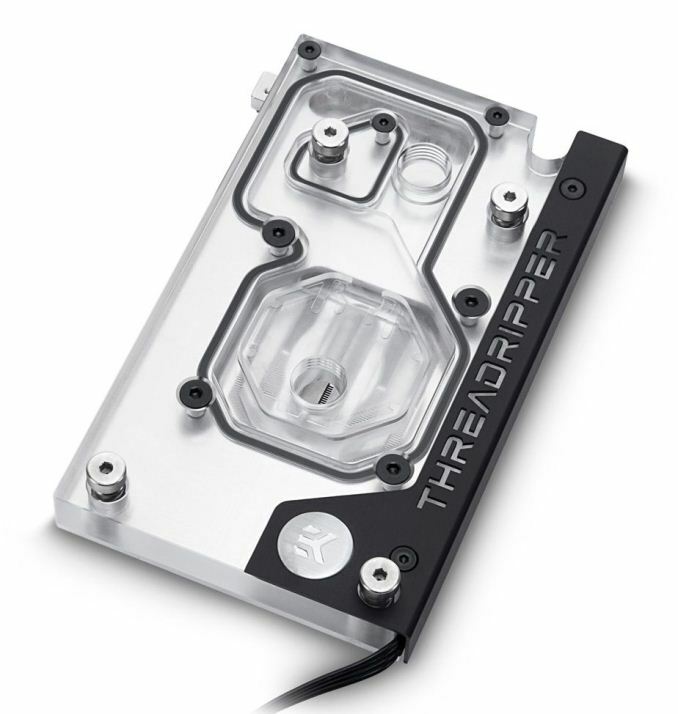 The base of both monoblocks is made of nickel-plated electrolytic copper, while the top is made of acrylic glass. The block comes fully assembled with nickel-plated mounting screws and brass screw-in standoffs pre-installed. This is the only style available. EKWB includes Thermal Grizzly Hydronaut (1g) thermal paste, as well as thermal pads for contact with the power delivery modules, in each package. Both blocks use standard G1/4 threading, and barbs are sold separately. 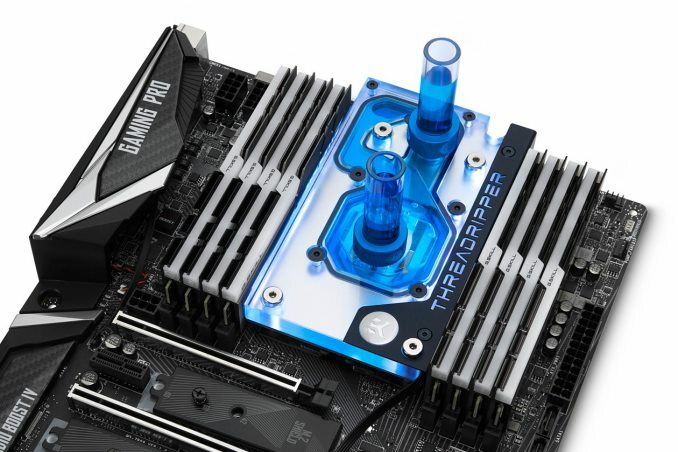 The GIGABYTE block (right, below) is compatible on two motherboards, the X399 Aorus Gaming 7 (rev. 1.0) and the X299 Designare EX (rev. 1.0). The MSI block (left, below) is compatible with the X399 Gaming Pro Carbon AC and the X399 SLI Plus. The different flow channels are due to each company layout being different. Each monoblock contains RGB LEDs, but uses them in different ways due to each motherboard configuration. The GIGABYTE block is equipped with a Digital RGB LED strip and connects to a dedicated 3-pin digital LED header. With this strip and the GIGABYTE RGB Fusion App, users are able to individually control color to each LED on the digital LED strip. The block also includes a standard 4-pin 12V RGB LED strip able to connect to the motherboard’s 4-pin LED header. 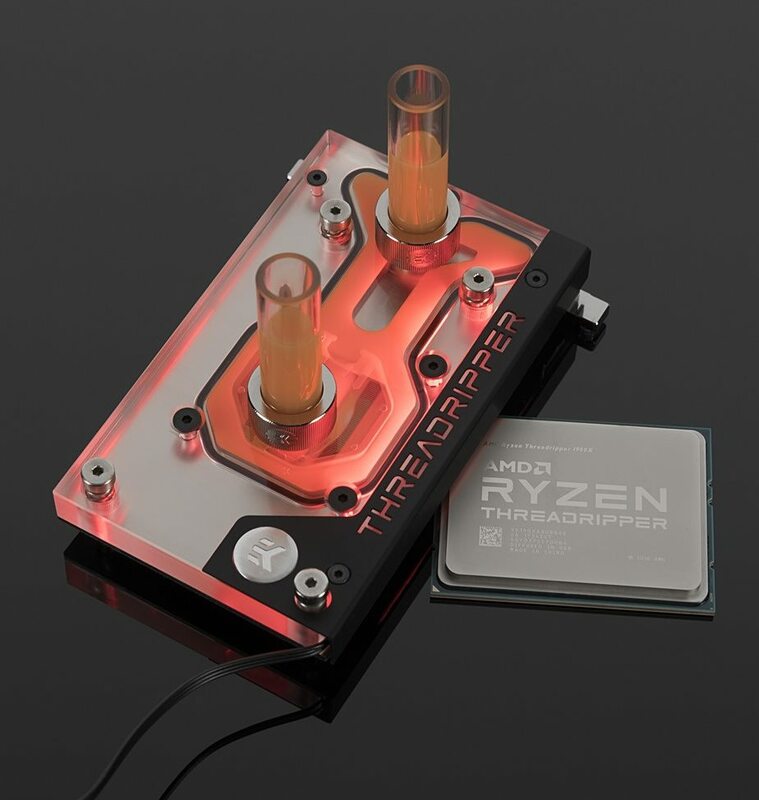 The LED shines through the base of the block and through a cover that has "Threadripper" cut out. The LED strip cover is removable for ease of adjusting cable orientation or replacing the LED strip. The MSI block, on the other hand, includes a 4-pin RGB LED strip controlled by its Mystic Light software and does not come with a digital or any additional strips. Both monoblocks are available now through the EK Webshop and their Partner Reseller Network. MSRP for both blocks is $139.99 / €125.95 (inc. VAT). There are separate links to the GIGABYTE and MSI versions. I'm sure it's great for cosmetic stuff, but what I've quickly determined about Threadripper and water cooling is that cooling isn't the issue, power delivery to the chip is. At least on my MSI board, the 1950X caps out at 272 amps. That puts OC levels in around the 4.1-4.125 range under the current process. Any higher then that and you get throttling in certain workloads (like prime95 under 'hot' settings) For 4.1 and below, the Enermax AIOs do great. At 4.1 GHz with my fans replaced by some noctuas, my max temp under prime95 hits around 65.6C.. Outside of that, the fans are off most of the time except when I do demanding stuff like video encodes or compiling. I know people get really excited about watercooling, but for those on a budget, Noctua's U14S air cooler is cheap, quiet, and highly effective for cooling Threadripper. 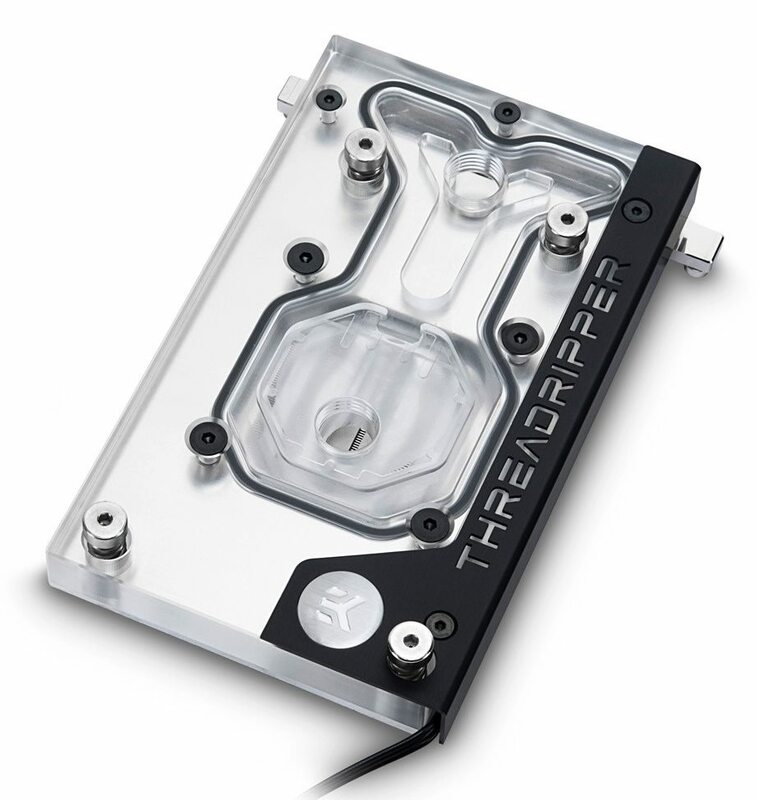 It's under $80 -- versus $140 just for this block and none of the rest of the watercooling setup. Heck, they even include some high quality thermal paste in the box. 1) You can't go insane with the voltage for overclocking (though its cooling rivals or beats some of the earlier less-optimized water cooling setups for Threadripper). 2) You need a case that is large enough to house a fairly tall tower air cooler.